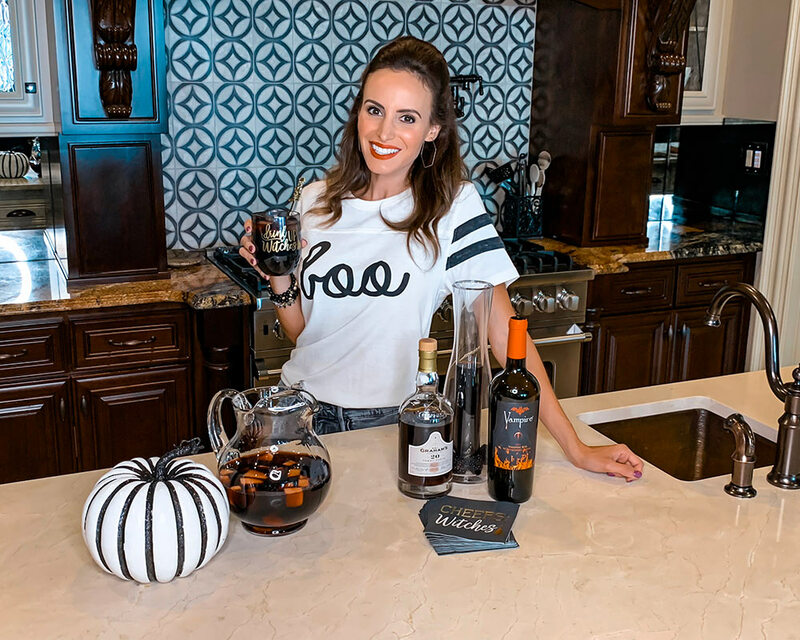 Get ready for all the Halloween fun with this easy Witch’s Brew Halloween Sangria Recipe! Am I the only one who thinks Halloween can be a “witch” sometimes? Seriously, trying to top last year’s Halloween costumes, making sure your home is known for the best candy bowl, and we can’t forget all the Halloween parties! Don’t get me wrong, it’s my favorite time of year, but sometimes this momma needs a cocktail to get me through. So if you’re looking for the easiest drink to make/consume before all the sugar and caffeine your kids will receive takes full effect, look no further. My Witch’s Brew Sangria takes my favorite summer drink into the colder months and, you guys, it’s seriously so easy to make (only 6 steps!). To make it a little more seasonal and spooky, I went with a darker fruit scheme with a red pear, plum, and blackberries. You can use any red wine you prefer. I was at the grocery store and saw this Vampire red wine and thought it was perfect for a spooky drink. Most sangria recipes call for brandy. In this mix, I went with a port wine instead of a brandy. To me, port wine is a really good mix between a sweet red and brandy and tastes AMAZING mixed with a red Merlot. But if you are #teambrandy, then, by all means, add it to the pitcher! I personally think presentation is everything when it comes to planning parties. Just a few simple pieces can make such an impact. So, of course, to top this recipe off, I just ran to our local Party City and grabbed a couple of Halloween themed napkins, stirrers, and plastic wine glasses… and voila! Festive AF! Watch the video here and screenshot the shopping list and instructions below for later! Add chopped red pear, plum and blackberries to a large pitcher. Add 1 bottle of your favorite red wine. Add 1 cup of port. Add 1 cup of tart cherry juice. Serve over ice and don’t forget to add some fruit to your cup! If you plan on making enough to share, I would definitely double the recipe to fill up the pitcher.